If you aren't compelled by the Series 4's bigger display, there's nothing that should stop you plumping for the Series 3. Thanks to watchOS 5 it has most of the same features and is now available for a great price. The Apple Watch Series 4 was released back in September, but the year-old Series 3 remains an excellent option, especially as prices are tumbling. The Series 2, Series 1 and the original Apple Watch have all been discontinued. It also runs the same software as the Series 4 - watchOS 5 - so the difference in use is fairly negligible. And, like the Series 4, it's also available in two variants; GPS only and GPS and cellular. Design and internal specs are the chief differences between the generations; the new watch is bigger for one thing. For a full rundown of the differences between them check out Apple Watch Series 4 vs Series 3. The Apple Watch Series 3 is available in both 38mm and 42mm watch sizes, both 2mm smaller than their Series 4 equivalents. The glaring red dot on the digital crown symbolises the cellular 4G/Cellular functionality added to the Series 3. (It has toned this down for Series 4). For the most part the spot of colour is a playful bit of fun, but it does clash with some of the band colours. Since the Series 4 emerged, the Series 3is now only available in silver and space grey aluminum finishes. There's also a Nike+ version (as there is with the Series 4). As there's zero design change to the Series 3 case from earlier versions, if you have existing bands from the original or Series 2 these will still fit. The bands are also compatible with the newer Series 4. The stand-out feature of the Watch Series 3 at launch was its 4G connectivity in the GPS+Cellular version, enabling you to ditch your iPhone completely should you wish to go for a run without it. There's a full 4G LTE and UMTS cellular radio antenna hidden in the display, which kicks into action the moment you step away from your iPhone. Available on EE and Vodafone currently, the system works with eSIM technology and shares the same number as your iPhone. So the Watch Series 3 doesn't have an interchangeable SIM that you can swap out at a whim. The built-in eSIM is over one-hundredth of the size of a traditional SIM, which is one of the reasons Apple hasn't needed to increase the size of the device. Other 4G-enabled devices, like the Huawei Watch 2 for example, take a nano SIM, so need to give space over to that card and the tray it sits in. In the UK, you'll pay an additional £5 a month to enable connectivity, but that's the only cost you'll have to incur aside from your regular phone bill. In the US all four major networks are covered. Such connectivity can be used to make calls, receive messages, stream Apple Music, or access Maps. The call interface is basic but easy-to-use thanks to a number pad. Favourite contacts is an even more straightforward way of calling friends, even more so if you've got a Bluetooth headset connected to the Apple Watch - such as the Apple AirPods. A swipe up from the bottom of the screen shows you the Watch Control Center, and it's here the Watch 3 tells you what the connectivity is like - whether that's Wi-Fi, phone, or 4G. With its own SIM connection, the idea is that you can ditch the iPhone completely. That's perfect for a run, or if you just want some time away from Facebook and Twitter. Call quality is clear, surprisingly so given the size of the device, and if you don't have headphones then you'll find yourself holding your watch arm up to your shoulder across your chest - we certainly did. For the most part the technology works as you would expect. The antenna in the Watch Series 3 works fine, but depends entirely on available coverage. For us, based in the UK, we've found that it's not as strong as the antenna found in the iPhone. While the initial problems of connecting to captive Wi-Fi networks, like those found in Starbucks, have now been fixed, there are still some problems that exist with the Apple Watch. Many of the Watch apps available still require you to have the phone connected. One of the greatest features, streaming music via Apple Music started off not being available, but now is and it great, especially if you want to listen to something on the spare of the moment that you've not previously had the foresight to download onto the Watch. The Apple Watch can't roam either, because it doesn't support global bands outside of its country. While we admit this is a first world problem and one that isn't likely to affect the majority of users, it's worth mentioning that if you travel out of the UK or US you won't be able to go solo with your watch. What is cool, though, is that you don't have to have your iPhone anywhere near you for the Watch to work after the initial setup. That opens up lots of possibilities, like still being able to call a taxi when your phone has died, being able to make an emergency call if you have an accident on a run, and just being able to not have your phone on you all the time in fear of missing that important message or call. While the design didn't change over th previous generation of the Apple Watch (Series 2), Apple made plenty of changes inside. Powering Apple Watch Series 3 is the S3, Apple's third-generation dual-core watch processor. The upgrade helped app launch times, enables smoother graphics and brings talking Siri to the watch using the built-in speaker. She is as clear as she is on the iPhone. The company has also improved the wireless chip too. The W2 chip delivers 85 per cent faster Wi-Fi and Bluetooth 5.0. Connecting to a pair of Bluetooth sports headphones took a fraction of a second while connecting to the AirPods is also seamless. In daily use last year's the Series 3 happily lasts for at least a day and usually quite a bit into the next - even with a GPS-recorded walk or run (auto-workout tracking is now enabled in watchOS 5). Just remember to take your charger for those long weekends away from home. 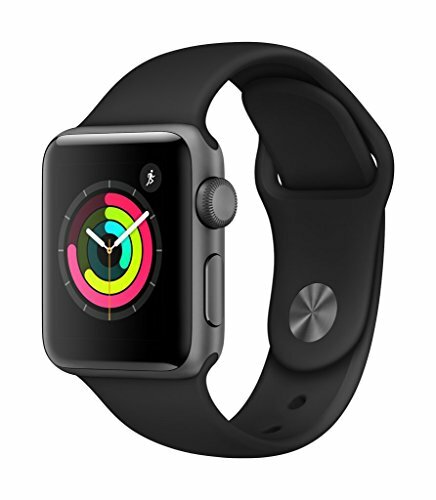 The Apple Watch Series 3 also features a barometric altimeter that assists with tracking activity, flights of stairs climbed and outdoor workouts, including elevation gain. This is most interesting to cyclists, skiers and boarders. It's a popular feature on high-end sports watches, like the Garmin Forerunner 935 or TomTom Adventurer, too. If you have the 4G/Cellular version of the watch you can stream Apple Music's 40 million songs on the go - without having to use an iPhone. In practice and it's a great feature but not an essential one, especially if you are good at planning. What it does mean and what we've certainly enjoyed is that mid-run or workout you can change the music without having to worry whether or not you've synced that song to the watch already. That's pure decadence, but it works really well. WatchOS 5 also introduced support for Podcasts. Spotify has also recently announced an Apple Watch app - not before time- but it won't enable you to listen offline or stream via cellular. Apple drastically improved watchOS last year and has done so again - watchOS 5 is a definite improvement not least because it can now detect workouts you haven't manually started. There's also new workouts for yoga and hiking as well as target pacing for runners and rolling mile data. The Siri watch face now works with Siri Shortcuts and so is way more useful - Siri can now also be invoked simply by raising your wrist. Notifications are now also a lot better with more interactions. The Walkie Talkie app also comes to Series 3 but it's not that useful. Far more compelling is that you can now sync podcasts to Apple Watch, too. When the Apple Watch Series 3 launched it didn't feel ready, but now it's a very different story. The big stand out feature is the 4G connectivity but the competitive price is also a consideration now that Series 4 has emerged. The Apple Watch is still the best smartwatch on the market - despite the likes of the Samsung Galaxy Watch and Huawei Watch GT making noise. And, since the Series 3 features most of the same stuff that's in the Series 4, it's a legitimate question to ask why you need the more expensive, newer model when most of the same stuff is here, for less money, thanks to watchOS 5. Of course, the key sell with Watch 4 is the bigger screen as well as thinner build overall. But if you don't need that then there's nothing stopping you from plumping for the Series 3. It's hard not to be mesmerised by Apple's new display but there's little here that the Series 3 doesn't have. Also we're sure there will be some for whom the 40 and 44mm sizes are just too big. You can pair Samsung's latest smartwatch with an iPhone, although naturally, it's more at home with Android. It's a well-made device that will give you an excellent battery life of up to four days.